Here it is! 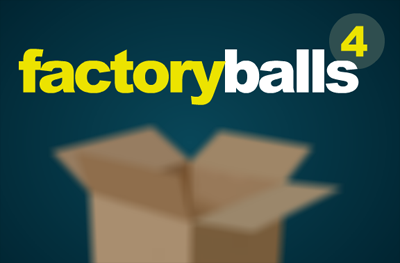 I made a new episode in the factory balls series: factory balls 4! So you know the deal: drag and drop a ball over the tools to produce the required ball physics in each level! This time you don't even have to drag and drop, you can also just click the tools. Enjoy! Spread the word and the link! Cheers! Stuck lvl 11...can't figure out how to color the halves only...i did on an earlier level, but now???? I don't know if I'm beginning experimented, but this game was very very easy. YEAH!!!!!!!!! I've been anxiously awaiting the new factory balls, I'm a big fan! Hey cool- I'm gonna try this out as soon as I get a chance; thanks Bart! I enjoyed it, thank you Bart! Thank you so much Bart for creating a new factory balls game for us! I love these games!!! It was very easy this time (maybe because one gets used to the tools througout the games) but even though I really really enjoyed playing it! Thank you so much! Looking forward to the next one as I hope that this part was not the last one. Very nice but way too easy :-) Anyway, thank you a lot! Finished it in one go. Thank you Bart for another marvellous game. I really enjoyed playing it! Very Nice and great Game Congrats Bart! YAY a new Factory Balls! Level 17 I reversed the red and orange and it still worked. Lvl 17 has an error, reversing the colours after completing the ball correctly. It still drops into the box. YAY ITS HERE ITS SOO AWESOME THANK YOU BART! Wow...I just realized you only need to click the paint cans and items. All this time I was dragging stuff around. Were all the Factory Balls like this? Glitch: I have 27 correct, but the ball won't fall in the box.. :/ I'll try once more. Love it! No glitches, played right through. Challenging but not paralyzing. Are you sure that you have it right? Maybe it's backwards. Yay! Factory Balls 4 is finally here! Thanks, Bart! Anyway, it was still good playing it, I always enjoy playing Factory Balls, it's a good logic exercise. I agree with vitormnt, this one was a lot easier than the others. I liked the idea of the paint, (I drew Queen F-B!!) but an eraser wouldv'e been infinitley helpful; I kept having to restart! Excelente como siempre, es cierto que este es mucho mas fácil que los anteriores, especialmente con el césped y la regadera. Gracias Bart! Hi! How about a color blind version (there a lot of players with this problem). You could use little dots,lines,... to mark the colors. Excellent, Bart! Much joy to my evening! I agree with Tea, you can never have too many Factory Balls. This one was easy, though. I totally dig clicking the tools. Very nice for folks with trackpads. Still, I could do these forever! Yahoo! Factory Balls 4! Let's play it! However... GREEEEAAT GAME, Bart!! I love this series!! Like, like, like it a lot!! Awesome game! it was so good! i had trouble getting through a couple levels, but it was challenging enough to keep my attention but easy enough to get through after a couple tries! WONDERFUL job Bart!!! Easier ? ... or am I getting better ? Thanks Bart. My family have all had a go at your game and we all love it. I guess I'll have to play agian because I didn't read the blurb saying just clicking is required. YIPPEE! I'm stuck on level 11! HELP!!!! Error on L15 too?.. Have it right but won't drop in box.. Your games are always fun, Bart. Thank you! right now, scraper is just an alternate white paint. Thank you Bart!Had a nice time with your new game!Excellent idea to be able to click on the tools directly!We are all well trained now on factory balls, so give us a hard time...on No5! GRETTINGS FROM M A C E D O N I A ! ! ! For those having trouble with level 11... try doing the yellow and orange vertical stripes first. Great game but really straight forward when you have abilities with space and 3D vision. Thanks Bart very challenging and my 6 years old daughter liked looking at me getting the right colors and shapes on the ball. This is not just a game. It's an institution. It's a phenomenon. My nine-year-old son (who has played the other Balls games) was riveted to it from start to finish. He solved them all, without help, but that's because he has sharpened his wits by playing the previous versions. Yeah, that would be awesome!! Honestly, the design of the ball really doesn't have to 'make sense' or be nice/pretty/whatever. As long as there's a challenge in recreating it, the game is great. As vitormnt mentions, the grass and flowers were really great (because they were difficult). Well, I often replay all of the Factory Balls. I simply just love the idea/concept. I'm looking forward to Factory Balls 5 (or perhaps a Factory Balls Christmas 2 ;)). got it on my own. nice end! the really epic intro music... am i the only one getting this every time i open it? Yay I finished! I really liked this one. I love the factory balls series. thanks for again a great, no classic game.. keep up the great work!! Oh such a great game! Can anybody tell me the name of the EPIC music? The music while playing! I think that the level where you can get the colours the wrong way round isn't a glitch, it's just a recognition that you got the right idea but made a slip. Why make you do it all again with two colours reversed? It's like a couple of points in Portal 2 where you're allowed to fire the wrong colour portal and it still works. The level(s) with the glitch where it *won't* accept the right pattern: is that one with thin vertical stripes? If so, you don't just need the right patten, but also the correct rotation, so try doing it the other way round. I do think that this is a bit of a glitch. I love that I can just click the colors and the tools. It's so much easier than the drag-and-drop method. Keep up the good work Bart! I can't wait for the next your game! Hooray another factory balls!! Easier, but that's goodish. And, I'm glad you didn't put in the growing stuff. Thanks Bart! I must say that level 11 was really hard for some reason, the rest were a piece of cake. There's always ONE level in game packs that's always harder than it should be. Lol good job, bart! Thanks! Love Factory Balls, but just wasn't challenging. By the way; I liked the clicking instead of dragging. And also a damn good backgrund-music ;) Does anybody know the name of it? I love your Factory Balls games, as always, but this one I found really easy - not sure if it's because it was easier than the other 3 or if I just got used to the puzzling style for this game-series. Either way, I loved the game! Thanks for making it! Had a problem in level11 but finally got.I enjoyed the game it was a bit wookie. I really enjoyed the game good job bart. But I liked how in previous games you could turn the balls into glass and put water/lights into them. I would like to see a future game that brings back these features. The concept is really cool, but as a R/G colorblind individual, this got unnecessarily difficult really fast.